It seemed that all of America was riveted by the Senate Judiciary hearings, regarding the sexual allegations made against Judge Brett Kavanaugh. So, I believe it is worth looking at the significance and meaning of all that was taking place. In many issues, there is often a ‘presenting problem.’ But behind each problem, you often find the ‘real issues.’ Kavanaugh’s case is an example of that, so let us first look at the ‘presenting or natural issues’ and then let us look at the ‘real issue’ behind what was happening. Kavanaugh was, however, counted as guilty by the opposition and it was as if he had to prove he was innocent. The “rule of law,” meaning that Americans are governed by laws, not by individuals, states that “In the United States, a person is considered innocent until proven guilty. (www.wabash.edu)” This presumption of innocence is the foundation of our liberties and protects us all from wrongful prosecution. Senator Susan Collins gave a brilliant and passionate speech that put it all in proper perspective. “This is not a criminal trial, and I do not believe that claims such as these need to be proved beyond a reasonable doubt. Nevertheless, fairness would dictate that the claims at least should meet a threshold of “more likely than not” as our standard. Without going any further, one needs to say this regarding the allegations. It is impossible to know exactly what, if anything, happened. It becomes, as Rachel Mitchell stated, ‘a he said, she said’ situation (www.documentcloud.org). Dr. Ford states she is 100 percent sure it was Kavanaugh. Kavanaugh consistently has denied that the sexual assault ever took place. It would take a book or more to go through all the related aspects to the case, such as why were the allegations made in a letter to Senator Feinstein and not revealed till the 11th hour, instead of being reported to the local authorities would have investigated the allegations. It can easily be seen as a delaying tactic to put back the confirmation until after the mid-term elections for political reasons. 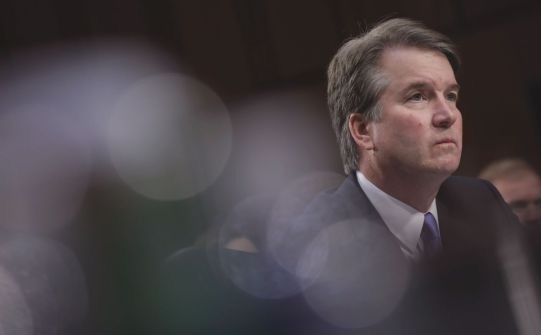 I would commend the article ‘Is their Healing after the Kavanaugh Crisis?’ by Lee Grady, one-time editor of Charisma Magazine, which gives insightful comments about this case as it relates to cases of sexual assault. We, as a nation, are divided; more so than any time since the Civil War. Jesus said, “a kingdom divided against itself cannot stand. (Matthew 12:25)” Now, some would see this as a division and a battle between the left and the right for the control in Washington and the nation’s future. It is a spiritual battle. The spirit of abortion was behind what is happening in Washington. It is definitely a war, a spiritual war. Back in 2016, many evangelical Christians were praying. Now is not the time to stop. We cannot stop because Kavanaugh has been appointed to the Supreme Court. We need to continue to pray for him, the Supreme Court, and for the next appointment, possibly in the not too distant future. The battle is intense, but the future of America is at stake. God still has a plan and a purpose for America to be a city set on a hill, a light to the nations, and a defender of Israel. But we must remember that the weapons of our warfare are not carnal but mighty in God for the pulling down of strongholds (2 Corinthians 10:5). So the call to believers at this time is to use those weapons and pray!